Mitch Stephenson, assistant professor of agronomy and horticulture and forage and range management specialist at the Panhandle Research and Extension Center, received the Innovative Extension New Employee Award during extension’s fall conference in Kearney, Nebraska Nov. 28-30. This award recognizes extension workers in their first three years of service who have exhibited an innovative program that reaches new audiences in new ways. 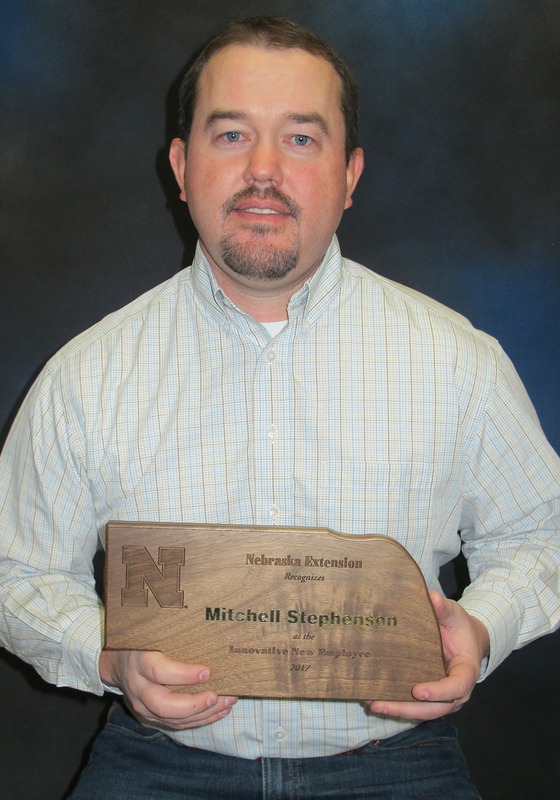 Stephenson began working with Nebraska Extension in 2015. During this time, he has had a tremendous impact with clientele and extension in Nebraska. As an invited speaker, he has given over 35 presentations on range and forage management. He has co-authored several publications for Nebraska Extension, Beefwatch and Cropwatch and other popular press articles. He has worked with extension teams in the Panhandle to develop workshops and field days addressing cheatgrass management, grazing management, and the integration of livestock onto established cropping systems with annual forages. He has also participated in establish programs for range management including the Nebraska Rangeland Short Course and the Nebraska Youth Range Camp. Stephenson was a team member in developing an award-winning University of Nebraska–Lincoln range and forage website. This website was selected as a winner of the website, blogs, and social media category at the 2017 American Society of Agronomy Extension Education Community and focuses on providing past and current information to producers. He also developed content for the range and forage management facebook page. Stephenson received a grant from, and is currently working with, the Nebraska Grazing Lands Coalition on an on-farm project that is evaluating the use of annual forages at several locations across Nebraska. Each producer hosted a field day and data collected the previous year was discussed. Integration of cover crops, annual forages and grazing livestock into production systems continues to be of tremendous interest to producers in Nebraska. This project has been an important component of delivering education for this demand. He currently serves on the Council for the Society for Range Management and is on the advisory board for the Nebraska Grazing Lands Coalition. Clientele in Nebraska who are dependent upon grazing resources for their agricultural businesses have appreciated Stephenson’s innovative, practical and applied approach to research and education. See https://ianrnews.unl.edu/nebraska-extension-presents-awards-fall-conference for a complete list of 2017 Nebraska Extension awards.